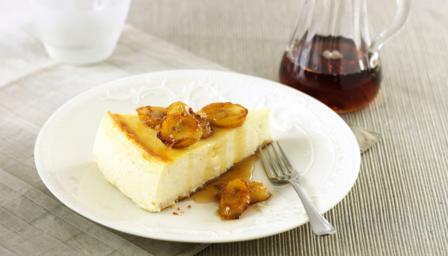 Make an American classic with James Martin's easy baked cheesecake that cleverly uses a ready-made sponge base. Preheat the oven to 180C/350F/Gas 4. Butter a 25cm/10in loose-bottomed cake tin. Cut the sponge horizontally into 2 discs. Use one to line a buttered cake tin. In a bowl mix together the sugar, lemon zest, cornflour and sultanas using a wooden spoon, then beat in the cream cheese. Add the eggs one by one, also add the vanilla essence, beating constantly until all the eggs are well incorporated. Slice open the vanilla pod, remove the seeds with a sharp knife and place the seeds into the cream mixture, add a splash of bourbon (about 4 tbsp), if using, and mix everything together well. Add the cream and beat well until the mixture is smooth. Pour gently over the sponge base in the cake tin. Sit the tin in a baking tray filled with 2-3mm of warm water to help create steam during cooking. Place into the preheated oven and bake for 50 minutes until the top is golden. Remove from the oven and leave to cool and set completely before removing from the tin. Just before serving, peel the bananas and pan fry in the butter and sugar until brown and slightly caramelised. Serve, cut into wedges, with the bananas and a drizzle of caramel sauce or maple syrup.